The ProCeas® is a complete pre-calibrated multi-component analyser based on the enhanced IR Laser Spectroscopy method OFCEAS. The ProCeas® features the association of a performant spectrometer with a Low Pressure Sampling (LPS®) system (50-100 mbar absolute) for the online analysis of several key gases in industrial, environmental and OH&S applications. 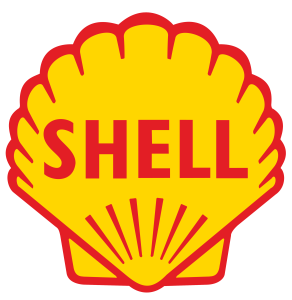 The association of the OFCEAS and LPS® technologies enables high spectral resolution, interference free, fast and sensitive analysis, regardless of the matrix of the gas to be analysed. 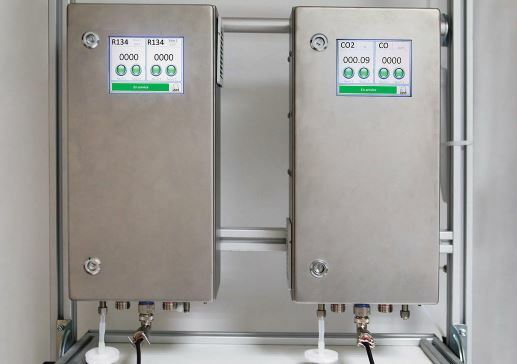 Thanks to the low sampling pressure (100-50 mbar), the ProCeas® system fits a large range of applications without the need to heat nor dry the sample prior analysis reducing considerably installation, operation and maintenance related costs. The ProCeas® is a true direct extractive process gas analyser developed and patented worldwide by AP2E (France). Realtime Monitoring system (No sample treatment) 50 – 100 mbar abs. sampling pressure removes any risk of chemical adsorption, desorption and condensation along the sample line. Low maintenance – The LPS® system allows flow low rates within 3 and 9l/h without affecting the response time and reducing considerably dust and materials build-up. No Drift and extremely low Limit of detection– The zero is contained in the signal, enabling automated and intrinsic zero drift compensation. Field proven – The ProCeas® is free of optical moving part and was designed and built strictly for industrial and on-board mobile applications. Monitoring air quality has become crucial to local authorities and industrials. Air Quality Monitoring programs are essential to understand and prevent pollution events, assess and identified emission sources. The ProCeas Air Quality Analysers provides AQMS owners and operators with a large number of advantages resulting in extremely low ownership cost, high reliability and and exclusive performances. 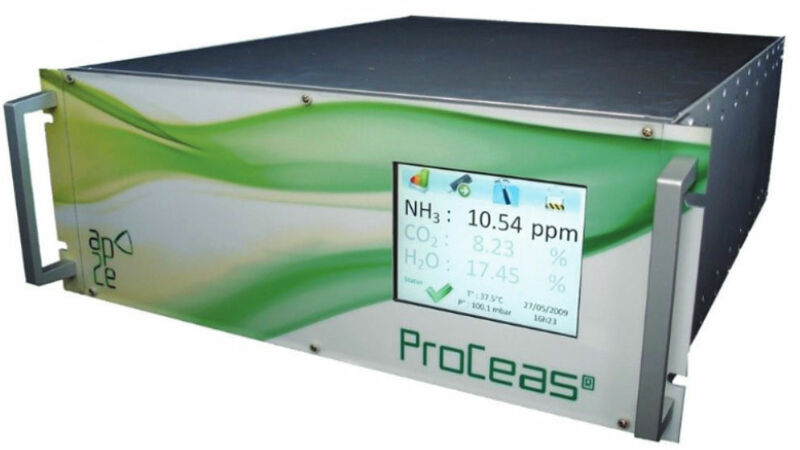 Thanks to the combination of the OFCEAS and LPS technology, The ProCeas Air Quality Analyser enables accurate and reliable realtime monitoring of trace compounds in ambient and indoor air. The ProCeas® FORMALDEHYDE is a complete pre-calibrated laser infrared spectrometer designed for realtime measurement of Formaldehyde trace (1 ppb) in ambient and indoor air. The ProCeas® CS2 is a complete pre-calibrated laser infrared spectrometer designed for realtime simultaneaous measurement of CS2, CO, CO2 and SO2. The ProCeas® NH3 is a complete pre-calibrated laser infrared spectrometer designed for monitoring of NH3, N2O and CH4 in ambient air. The ProCeas® TRS is a complete pre-calibrated laser infrared spectrometer designed for monitoring of SO2, SO3, H2S (and more) in ambient air. The ProCeas® H2 Trace is a complete pre-calibrated laser infrared spectrometer designed for realtime monitoring of H2 traces in ambient and indoor air. The ProCeas® CO is a complete pre-calibrated laser infrared spectrometer for rapid real-time measurement of CO in ambient and indoor air for OH&S purposes. Gas Analyzer for Submarine Air monitoring. High resistance to military environment. Large temperature and vibration resistance. The ProCeas® NAV is designed for monitoring gas CO2/CO/Freon/H2S/H2/O2 …in nuclear and traditional submarines.